Provided survey & engineering services relative to the replacement of 1,640 linear feet of timber bulkhead with the proposed epoxy coated steel bulkhead. Alterative designs were developed and presented to the Town of Islip including both vinyl and steel sheet bulkhead. Permits obtained by LKMA include NYSDEC, US Army Corps, and NYS Department of State. Site survey and bulkhead structural analyses were all performed by LKMA staff. 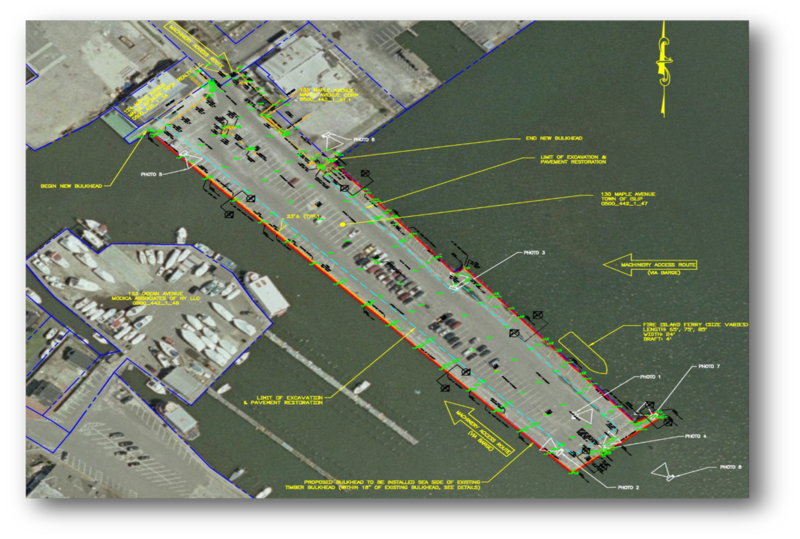 Project was federally funded under the FHWA Ferry Boat Discretionary Grant Program and was administered by the NYSDOT. LKMA prepared the NYSDOT approved Design Approval Document (DAD), contract documents using State approved specifications and construction inspection and administration services in conformance with NYSDOT specifications and procedures.